Lord King of West Bromwich, who as a Patron of the Universal Peace Federation was hosting the event, added that this was one of the most enjoyable and meaningful afternoons he had spent in the House of Lords listening to the testimonies of young future leaders speak about their activities. 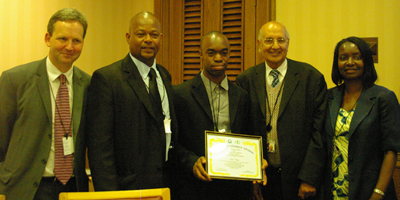 Another awardee, Andre Hackett, (photo above) from South London, is an inspirational personality who is promoting MAC, Make A Change! Out of the tragic loss of a friend through gang violence, he helped create STOP, Solve This Ongoing Problem. He is currently sponsored and mentored by the International Law Firm Linklaters to Study for one Year at the School for Social Entrepreneurs. As the Co- Founder of We Make a Change Ltd alongside Richard Abiona and Alexander Rose, he is entering into his fourth year of working on community based projects in London working with young people to raise money for orphanages in parts of Africa. In 2008 he led a group out to Ghana to see how far the money raised here had gone to changing the lives of others. They market T-shirts of the STOP campaign in order to raise money. He came to Youth AID through other youth work he was doing at Uni. He was asked to come and play piano for a Youth AID awards ceremony. When he saw how young people’s lives were being changed he realised that this was something inspiring in which he wanted to be involved. He is now a member of the Lewisham Youth AID Management Team. Heidi Alexander MP congratulated Keldon on his award. She commented that his work is incredibly important in Lewisham because it allows young people to expand their horizons by creating accessible and credible role models. She added that she had arranged to go to visit Lewisham Youth AID soon to see their work. Oli Fawcett (photo left) spoke of his work with the Hasting Youth Council, the East Sussex Youth Cabinet, the Hastings Community Network and the Local Strategic Partnership to represent the views of young people. He added that they had introduced an anti-bullying charter in schools. 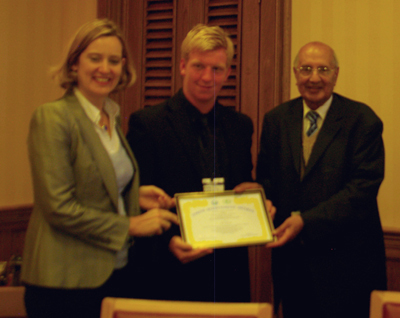 He has led activities to make young people aware of people from other faith backgrounds. Maggie Boulter of the East Sussex Youth Department explained that the Youth Parliament programme allowed the voice of young people to be heard. Rashioh Koroma, from Birmingham shared about the trauma of friends who were forced to become child soldiers in Sierre Leone and the strategy and motivation of those who were engaged in conscripting children into factional armies. He came to the UK as an ‘unaccompanied minor’ from Sierra Leone. He and some friends created the Peace Band as a means of healing and raising awareness about the issue of child soldiers. The Band sang a song to during the programme. Dr David Earle said that he was impressed by Rashio and his friends who had dealt with their very difficult circumstances of growing up in Sierre Leone by not getting resentful and bitter but by turning their situation into something positive. He had done many activities some that he had not mentioned in his talk. Elisa Brann (Photo left receiving award) shared about her time with the Youth Service International in Holland. She took a gap year to attend a service project leadership training course, first working in small groups then later initiating and carrying out their own projects working with immigrant communities in Holand. On returning to London in Autumn of 2008, as part of Global Peace Festival, she put her skills into a series of seven or eight service projects, involving 300 young people from Europe ranging from environment clean up projects to decorating community centres. Currently she is a University student who volunteers in various activities without taking a leadership role trying to practice a lifestyle of living for the sake of others. An awardee, Shabnam Khan, (photo left) is very active in Muslim youth activities to teach Qur’anic Arabic, producing radio programmes for a Community Radio station, empowering young people through a programme called VIP Minds – Vision Inspires Passionate Minds and running a Muslim Youth helpline. Rui Octavio Jorge, (photo below) from North London, is an inspirational speaker who was prominent in the V-inspired campaign to promote volunteerism. He worked on a project of Open Mic where young people were invited to express themselves in whatever area they felt like. This later became a national programme of V-inspired. He emphasised the need to volunteer in order to gain experience and find employment. He spoke of his own determined effort through which he overcame his own difficulties and was able to empower others. 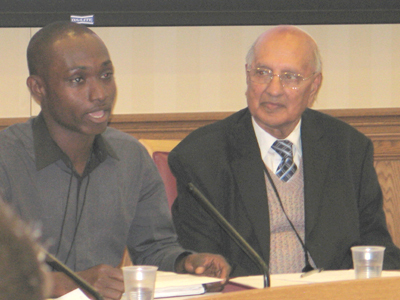 He felt that young people were being victimised by all the talk about gun and knife crime. He and his friends began ‘The NUTMEG Community’ meaning, ‘New Unique Talented Motivated Energetic Generation’ that attracted 500 young people to get involved in public debates, music and other activities. 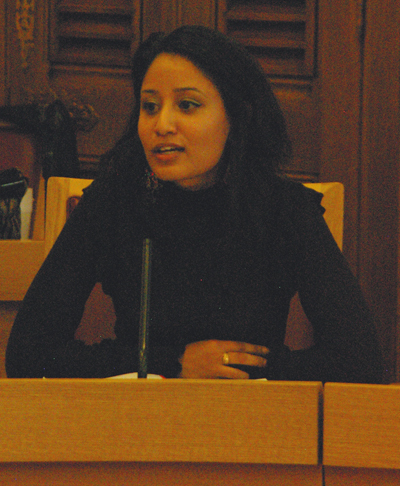 Ally Sultana (photo right) spoke of her work in Birmingham, with a networks of groups in a campaign against domestic violence. Women began to open up to her and trust her after a little while. During the last three and a half years she was involved in a campaign against domestic violence against women. She found that there were a lot of good people doing good work in isolation. In the building of a network we have been much more effective. We have done various events and campaigns for local women in particular. What I found was that no one is too difficult to contact if you make an effort. In the last six months she has been working for women’s civic engagement. It entailed upskilling women to enable them to meet and engage with local decision makers. She also did theatre performances in schools to recognise violence at home and to get help rather than cover it up. Faeeza Vaid, (photo left) from Birmingham, said her goals were always very high. From a young age her father use to address her as future Prime Minister, even though she had no interest in politics! Soon after receiving her award she was interviewed by various media outlets as a spokesperson for Muslim women on the Burqa issue as that day France's lower Assembly voted to ban the Burqa in France. Brooke Borg and Brandon Borg (photo left with Lord King) from Malta, wanted to inspire young people to achieve and have a positive outlook in life through music. Brooke always wanted to be a singer and came to London to develop her ability. They enjoy running workshops to support others to learn to express themselves and fulfil their talents. She sang the dynamic theme song of the workshops ‘Love Not War’ during the programme.